We are currently enjoying one of the most exciting renaissances in garden design. The traditional garden with a rectangular lawn surrounded by a series of beds has become dated. New designs look at the garden from a totally different perspective still considering shape, form and functionality but looking far deeper into the emotional impact of the garden. 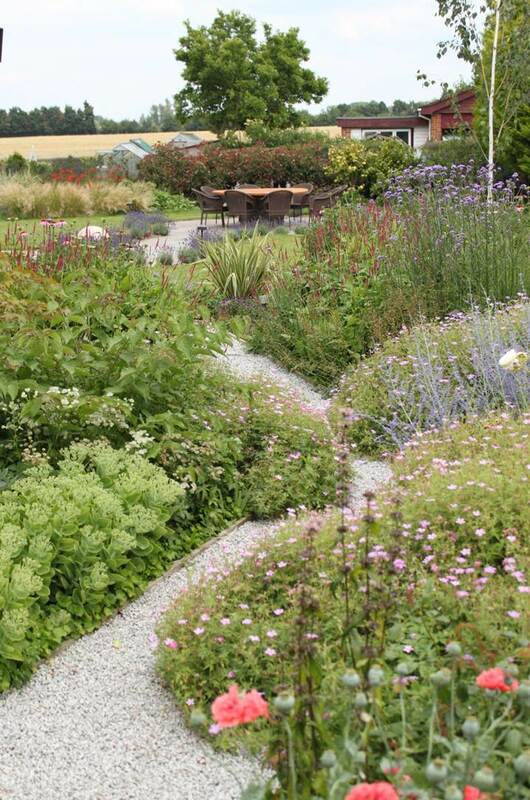 Renowned international designer, Piet Oudolph introduced us to prairie or drift planting some years ago. A more natural way of planting, reminiscent of how plants grow naturally, this approach has developed and influenced the whole garden design including planting styles and materials used. At Accent Garden Designs, we have developed this into what we call Holistic Garden Design. 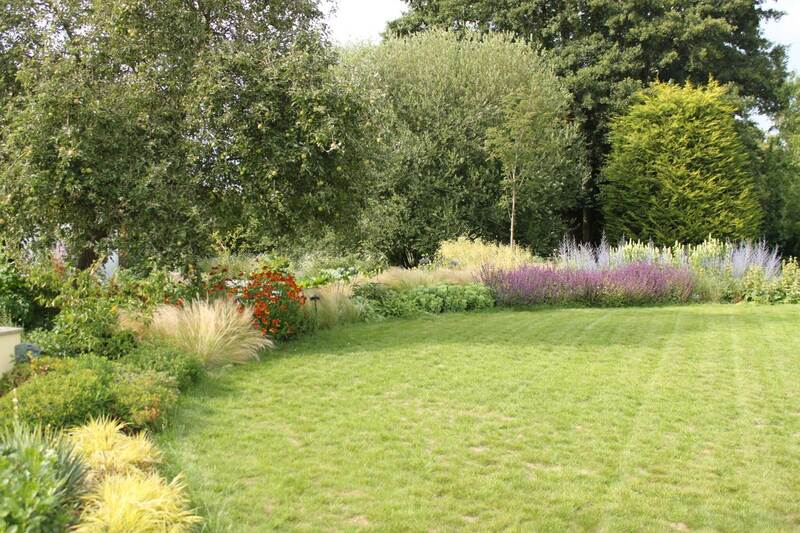 Naturalistic planting in one of our gardens, creating interest throughout the year. Holistic Garden Design is different from conventional design processes. Many of our clients are intimidated by the prospect of specifying plants and having to describe the details of a new garden but are happy to talk about themselves, their lifestyle, values and needs. These elements inspire the design of the garden. This modern garden design approach still looks at the aesthetic and practical elements of the garden but goes deeper into emotional values. Although we tend to think of the visual when thinking about the aesthetic, the definition of the word talks about the perception of the senses. Modern design doesn’t just relate to the garden’s visual impact, it also considers touch, smell and even sound. The natural planting styles championed by the likes of Piet Oudolf and Tom Stewart Smith create soft flowing planting that sway and dance with the breeze adding a sense of character and movement creating a textural impact in innovative and interesting ways. Most people are familiar with texture when talking about fabrics, less so when dealing with plants and materials in the garden, yet there are a whole variety of effects created through the use of different textures. The soft touch of Stipa grasses, the wonderful bark of Acer griseum and the waxy sheen from Berginias add enormous depth of interest to the garden. Texture, aligned which shape is the basis of a well designed planting plan. Spiky fans and bold textures generate energy and drama where soft textures and dome shapes are restful and unimposing. The ‘cloud plants’ are ones that have little form themselves but add mid-ground atmosphere to a bed. Plants such as Thalictrum and Foeniculum have this property and help create an atmospheric subtlety that is missed in more traditional designs. Similarly, in hard landscaping, the mixture of natural materials such as oak and slate in paving is wonderful, creating a relaxing calm. Replacing traditional gravel with brightly coloured tumbled glass adds fun and vibrancy. Not appropriate in every garden but so exciting in others. The result of looking at the garden in a holistic way is a garden more aligned to the user’s needs, that they can identify with on a deeply personal level and that by capturing the timeless character of nature will remain beautiful and enjoyable well into the future.